Watching Steven Moffat and Mark Gatiss' Sherlock evolve from the superb "The Reichenbach Fall" to tonight's season four premiere has been like watching a car crash in slow motion. Season three on the whole would represent the moment you lose control of the car and everything starts turning pretty grim. Last year's Victorian-But-Not-Really-Victorian one-off special "The Abominable Bride" didn't help matters but at least, like a car in mid air, there was a bizarre kind of spectacle to it. And now, with "The Six Thatchers", the car has come crashing down to the ground with barely a shred of anything left from before. This episode alone represents everything wrong with Sherlock as a show, and for all of it to be crammed into a singular 90 minute instalment made for some pretty unfortunate viewing. Shall we start at the start? The first half hour of "The Six Thatchers" was good. I'd go as far as saying it was great. Aside from a wobbly cold opening - one that once again shows little understanding of how to keep Sherlock cruel and careless but still a likeable on screen presence - things moved quickly, and it felt like season one again. Lestrade shows up at 221b Baker Street, gives an exciting case to Sherlock, and the three of them set out to solve it. "It's a doozy" says Lestrade, and he's right. The little case we're introduced to is filled with exciting prospects and potential alleyways to mysteriously swoop down. From here, Gatiss (who penned this episode) buys us into this case well and I couldn't help but grin from ear to ear. After a season that essentially gave up being a detective show, it was terrific to have this element back again. And then Sherlock solved the case. Just like that, it was over. "Hang on, though" I thought. "Maybe this will be like 'The Great Game' in that we'll have lots of little cases to follow!". Well, I can only hope, right? We start to follow a new thread, a new kind of case emerges, and then, right as it's about to get really exciting and give us our first piece of real evidence, it throws it all away and makes the whole thing about Mary. This is where things get complicated. 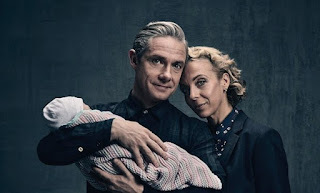 Amanda Abbington is a terrific actress, and she plays Mary very well, but Mary is a deeply flawed character. Her history is meaningless in respect to who she is in the show's present. I understand Sherlock's desire to flesh her out and give her a backstory, but a backstory that makes us doubt every word she speaks is entirely counterproductive when we look at who she represents. Just when we think we might be okay to trust her, the show turns it against us again and reveals more of her lies, and then it expects us to care when she sacrifices herself for Sherlock at the episode's close? No. That is not how storytelling works. You cannot give a character a backstory for the sake of giving them a backstory, and then repeatedly use that backstory as a way to trick the audience. By trying to flesh Mary out and create a more interesting female character, Sherlock has instead turned its lead woman into a plot device. There are lots of other issues with the episode too - it lurches from scene to scene with barely anything connecting them, the entire subplot of John and the woman from the bus is meaningless and and frankly stupid, and the episode's final showdown is so devoid of emotion in such an important scene that the whole thing verges on pastiche - but it's this key misunderstanding of every component of what Sherlock should be that lets this episode down. Sherlock Holmes is a detective. He detects. That is his story. I understand that Sherlock can't do the same thing every week, and I understand that shows must grow and develop across time, but when they grow and develop in a way that threatens to leave behind all that made the show so special in the first place, it's really not good. It would be like watching all of the Parks & Recreation characters turn into unpleasant people, or watching Game of Thrones throw all of its characters together and halve its budget, or if Breaking Bad decided to make Walt and Jesse part ways just two seasons in. Yes, it is development, but at the cost of what made that show so exciting in the first place. Sherlock was a superb show for two of its seasons, and some of its early material is phenomenal, but it's straying so far now from what it needs to be that I fear we've lost it for good. Next week's episode is written by Steven Moffat, which gives me a little hope. His scripts are always stronger and tighter than Gatiss', so hopefully we can expect at least a small improvement in a week's time. There was nowhere near enough Molly and Lestrade and Mrs Hudson tonight. These are characters that are all fun and nicely defined and interesting and enjoyable to spend time with, even without complex backstories. This is what Mary needed to be. Seriously, that whole "Will John have an affair with the woman from the bus?" thing was so empty. Is it supposed to show that John, contrary to what Mary thinks, isn't perfect? Is it supposed to show his colder side? Is it supposed to show that all three main characters are damaged and imperfect? I really don't know. Toby Jones appearing in the bus stop advert was a nice Easter Egg. This was Sherlock's weakest episode to date for sure. Please come back next week, show? Precisely my thoughts when I saw the episode. Good Write up! Thanks! Yeah certainly not the show's greatest episode. What did you make of episode two? ?